SR Series: SR7110, SR9210, SR9750, SR9850, SR9860D with GPS antenna. SC Series: SC7105, SC9205, SC9705 with GPS antenna. Struggling to get a GPS lock ? Here’s a few tips and pointers to getting a good consistent GPS signal lock. Provided a GPS antenna has a good view of the sky, generally, a GPS signal lock should be achieved within a few minutes. However, in challenging conditions, such as indoor antenna location, or if the antenna has a much reduced view of the sky, it can take much longer to acquire a GPS lock. In such circumstances, we recommend that the device should be left for around 1 hour after power-up to try to achieve a signal lock. 1. GPS systems utilize the global positioning system, which is a constellation of satellites orbiting the Earth. Therefore, ideally, a GPS antenna should have the best possible view of the sky – ideally, 360 degrees. 2. If the GPS antenna is located indoors, metal structures can block the weak GPS signals and prevent a signal lock. Ensure the antenna is mounted away from metal frames, structures or enclosures. Metalized, sun-dimmed, glass contains metal flecks to reflect sunlight which also reflects GPS signals can also cause problems. 3. Check that the red ‘GPS Antenna’ LED at the rear of the SR/SC/LC series unit is NOT illuminated. The LED illuminates when a short-circuit is present along the cable to the GPS antenna, which must be cleared. 4. If available, a volt-meter can be used to check that 5 volts is present at the GPS antenna connector between the inner pin and the outer shell of the TNC connector. If a voltage is not present, it indicates an open-circuit fault along the cable. 5. For externally mounted antennas TimeTools recommends fitting a surge suppressor to protect equipment from lightning strikes and other electrical surges. A surge suppressor should ideally be located where the GPS antenna cable enters the building. If a GPS surge suppressor is fitted, ensure it is fitted the correct way around, with the ‘Surge’ input going to the antenna and the ‘Equipment’ input to the time server. See Fig 1 for typical installation. 6. Check the cable and connectors for any visible damage that may have occurred during installation, particularly where the cable has been fed through holes in walls. 7. If you have sourced your own cable, rather than obtaining it from TimeTools – ensure that it is of the correct type and not too long or too short. If required, GPS amplifiers, such as TimeTools T-AD200-8 can be used to amplify GPS signals and increase cable distances still further. Also, our GPS over fiber kit can utilise fibre-optic cable to transmit GPS signals over many kilometers. 8. The ‘GPS’ tab on the web status and configuration menu provides detailed GPS receiver status information. It can be used to list satellites currently in view along with their associated ‘signal to noise’ ratio and position in the sky. Fig 1. 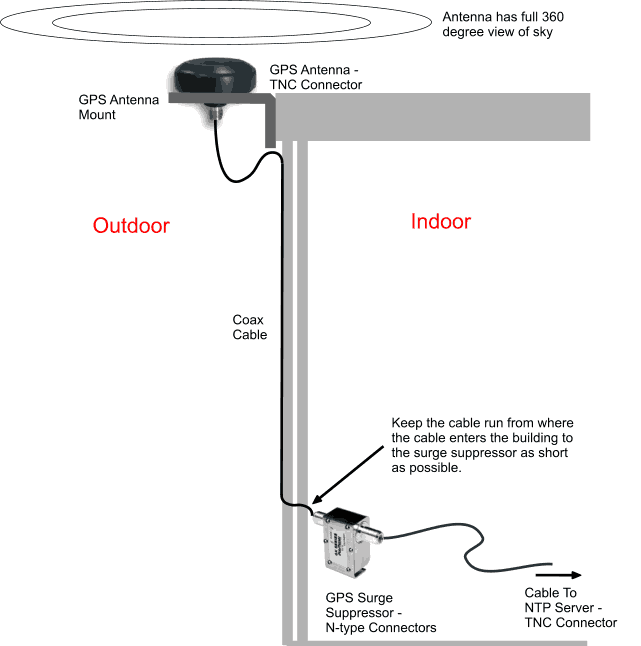 Typical GPS installation, with antenna on roof-top and surge suppressor located where the GPS antenna cable enters the building. SPP-GPS Installation Guide – Please read before installing.